Lithuanian traditional dress was most often made at home, using natural dyes for coloring the yarn. It was commonly seen in Lithuania through the middle of the 19th century. By the beginning of the 20th century, traditional dress had become a thing of the past, even in small villages. Hand made clothing had been replaced by manufactured materials. Many of the traditional items were passed down generation to generation and were considered part of a bride's dowery. Special items of traditional clothing are featured in museums now. If you are fortunate to be in Lithuania during a national holiday or during a festival, you may still see Lithuanian folk costumes. 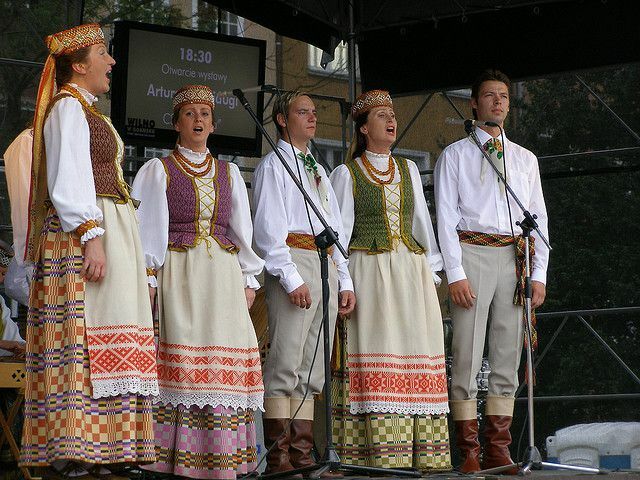 Folk dancing and singing groups often wear traditional dress. And, in the Lithuanian culture, it is acceptable to wear traditional dress on a dressy occasion. Men's and women's Lithuanian folk costumes feature a variety of colors, designs, textures, and patterns. It's common to see women wearing aprons embroidered with geometric designs covering long plaid skirts. Jewelry is part of the dress and most often you will see women wearing jewelry with local amber. Women may cover their hair with scarves or wear unique pillbox hats. Hats trimmed with ribbon and vests are also typical elements for Lithuanian traditional dress. The men's clothing, while understated, is decorated with woven sashes and boots are the traditional footwear. You'll often see striped, tapered slacks with long jackets worn by men. You'll often see Lithuanian girls dressed in plaid skirts and matching vests. Their blouses and aprons are trimmed with lace and embroidery. The colors in the material are determined regionally according to custom. Vests are typical accessories for both male and female Lithuanian traditional costumes. Women's vests are often fitted with a ruffle at the waist. The shirts are worn over long-sleeved blouses with collared necks. The pillbox hat, which is often richly decorated and may be finished with long ribbons that trail down the back, is common to Lithuanian traditional dress. Men may wear long coats over their shirts and vests. Woven sashes are a part of Lithuanian native dress and can be purchased as souvenirs by visitors to Lithuania. The sashes the girls wear cinch the waists of their vests and match the pattern embroidered on their aprons. Women dressed in traditional wear often style their hair in double braids. Instead of embroidered aprons, many women wear clean white lace aprons over their plaid skirts. Like some traditional costumes from Lithuania, these outfits are designed in subdued tones. Green and red plaid woolen fabric is typical to the region of Aukštaitija. A geometric red-and-white embroidered or woven decoration is also typical to this region. Long dark coats and hats, and leather boots typify the male costumes from Aukštaitija. Hats with elaborate decoration are often a part of traditional Lithuanian clothing for women. A pillbox-shaped hat may be adorned with ribbons that trail down the back. Sometimes these ribbons are plain; other times, they are a major decorative element for the outfit. When not wearing a hat, women often wear white scarves covering their heads. What Are the Traditional Folk Costumes of Romania?